, whose name was James Fournier, was a native of Saverdun, in the diocese of Pamier, the son of a miller, or of an obscure person; but some are of opinion that he was descended of a noble family. He embraced a religious Hie when young, among the Cistertians, and having afterwards received the degree of master of divinity in the university of Paris, he was made abbot of Fontfroide, in Narbonne, and when he had governed that monastery for six years, with great applause, he was made first bishop of Pamiers, and nine years after translated to Mirepoix. In December 1327, pope John XXII. created him cardinal presbyter of St. Prisca, and in 1334, he was elected pope, contrary to all expectation. The conclave had chosen Comminge, cardinal bishop of Porto, as the most proper person, but the French cardinal insisting that he should promise never to go to Rome, he refused to accept the office on a condition so prejudicial to the church. 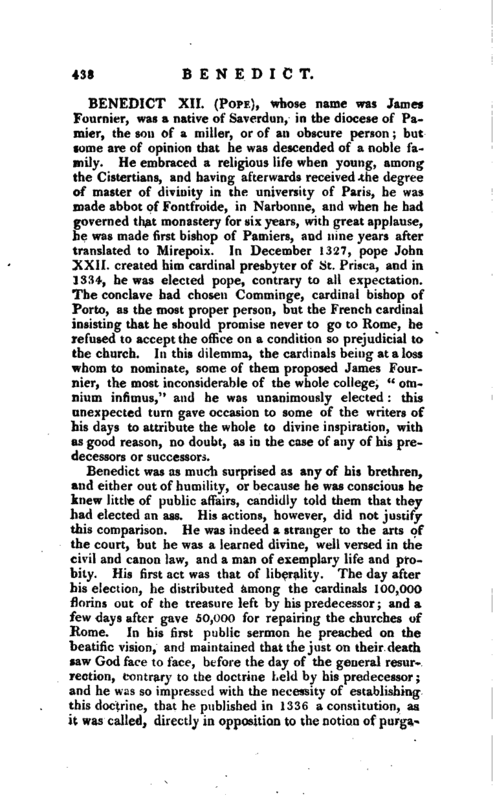 In this dilemma, the cardinals being at a loss whom to nominate, some of them proposed James Fournier, the most inconsiderable of the whole college, “omnium infimus,” and he was unanimously elected: this unexpected turn gave occasion to some of the writers of his days to attribute the whole to divine inspiration, with as good reason, no doubt, as in the case of any of his predecessors or successors. 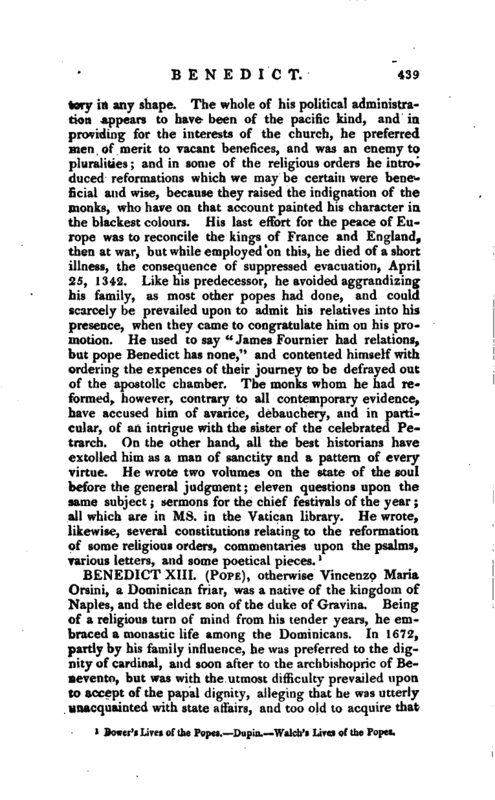 Bower’s Lives of the Popes.—Dupin.—Walch’s Lives of the Popes.